Cholesterol Metabolism, LDL, and the LDL Receptor focuses on the cholesterol biochemistry and lipoprotein metabolism. 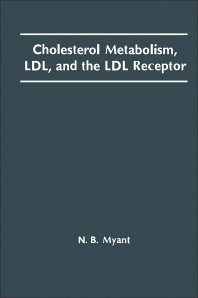 This book is organized into 10 chapters that describe the coordinated actions of three regulated processes, namely, the intracellular synthesis of cholesterol, its esterification by ACAT, and the receptor-mediated uptake of low-density lipoprotein (LDL), for optimal level of free cholesterol. The first five chapters explore the various aspects of cholesterol biology, including discussions on the interaction of ligands with their cell-surface receptors; the role of coated pits in the endocytosis of receptor-bound ligands; and the recycling of receptors through the interior of the cell. These chapters also examine the regulation of gene expression encoding inducible proteins and the use of natural and synthetic mutations in studies of the functions of the separate domains of a multifunctional protein. A chapter describes the cloning of the apoB gene, the receptor-binding domain of apoB-100, and the unusual mode of derivation of apoB-48. Considerable chapters are devoted to LDL receptor and its pathway. The concluding chapter deals with the clinical consequences of genetic dysfunction of the LDL receptor, with particular emphasis on the diagnostic and treatment approaches of familial hypercholesterolemia that are based wholly or in part on knowledge of the LDL receptor or its gene. This book is an indispensable guide for biologists, physiologists, and clinicians who are interested in the epidemiological field of cholesterol and heart attacks.